A key period in Spanish art history was initiated with the construction of the monastery of El Escorial on the orders of Philip II. The arrival of a significant number of Italian artists, commissioned by the monarch to decorate the building, brought about a rethinking of Spanish art which was particularly significant in the field of drawing. The first Italian artists to arrive were the Florentines Romulo Cincinnato and Patricio Cajés, contracted by Luis de Requesens in Rome in 1567. That same year saw the arrival at the Spanish Court of the Genoese painters Giovanni Battista Castello, known as Il Bergamasco, his son Fabrizio Castello, his stepson Niccolò Granello, and Francesco de Urbino. It was not until 1583 that Luca Cambiaso arrived, followed two years later by the celebrated Federico Zuccaro. The year 1586 saw the arrival of the Milanese painter Pellegrino Tibaldi and his young pupil Bartolomé Carducho. Many of these artists settled permanently in Spain, marrying and starting their own families, from which emerged some of the most important artists of the first half of the 17th century. The technique of this drawing, executed in an incisive manner in pen with light wash, is closely comparable to other sketches by the artist. The subtlety of the washes is similar, for example, to the Ecce Homo in the British Museum, London, and to the Explanatory Sketch for the Decoration of the Library of El Escorial (also British Museum). 3 The latter reveals a similar approach to the pen strokes, particularly in the hands and folds of the figure’s mantle. In addition, the present figure type, which is solid and volumetric in the manner of Michelangelo, recalls Tibaldi’s models. However, certain weaknesses suggest that this drawing may in part be the work of an assistant or workshop employee. 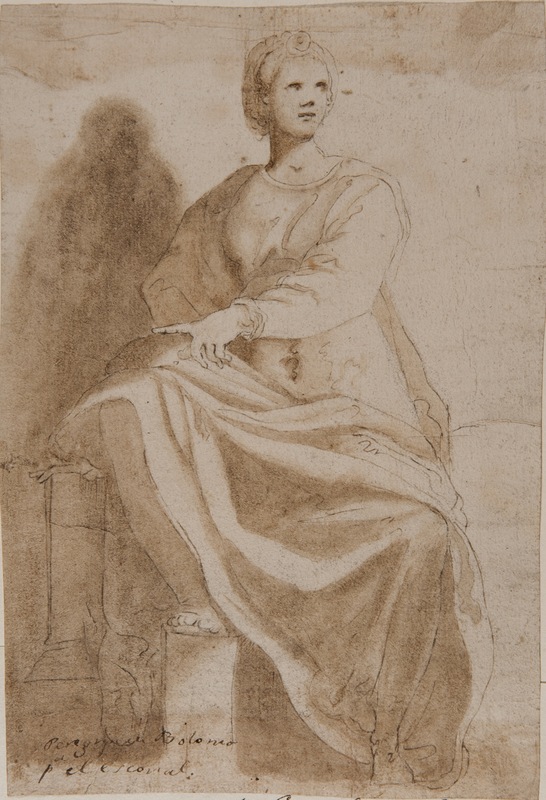 A close examination of this drawing reveals how the principal figure was intended to depict a Sibyl. She is seated, looking away to the left. Resting one leg on a small plinth, she points to the right. The lighting enters from the left and casts a strong shadow over the left arm, which is set akimbo. These elements, combined with the powerfully volumetric nature of this mature female figure, may suggest that it was intended for one of the powerful allegorical figures representing Dialectic, Arithmetic or Philosophy depicted in the library’s frescoes. However, it would appear that the artist immediately decided to modify his initial iconographic conception in order to turn the figure into an allegory of Fortitude for another, unidentified room. This explains the appearance of the column, which is Fortitude’s traditional attribute, located on the left in a secondary position, almost hidden in the shade and with no light falling on it. 4 It seems plausible to suggest that the artist’s intention was to adapt this figure to one of the rooms of the type painted by Francesco de Urbino in the monastery’s Chapterhouse, which has allegorical figures of Fortitude and Charity painted between 1581 and 1582. Another reference point may be the figures of Meditation and the Figure crowned with Laurel, painted by Niccolò Granello and Fabrizio Castello for the Ante-sacristy between 1583 and 1584. In addition, there is a modern inscription reading “Peregrino de Bolonia para la Libreria del Escorial” on the sheet of paper on which this drawing is laid down. For the decoration of the ceiling, see Béguin, Sylvie, “Pellegrino Tibaldi” in Dibujos italianos para El Escorial. Madrid, Nerea, 1995, pp. 92ff. This article includes the bibliography on the decoration and symbolic meaning of the library’s frescoes. Carmen García-Frías detects the involvement of Bartolomé Carducho in the London drawing. In: Béguin, Sylvie, “Pellegrino Tibaldi” in Dibujos italianos para El Escorial. Madrid, Nerea, 1995, p. 93. Cesare Ripa comments on the figure of Fortitude: “This woman leans against a column as it is the strongest element in a building and the one that supports the others”. Ripa, Cesare, Iconologia. Rome, 1593 [Ed. Madrid, Akal, 1987, vol. I, p. 437]. For these figures, see: Giampaolo, Mario di, Los frescos italianos de El Escorial. Madrid, Electa, 1993.